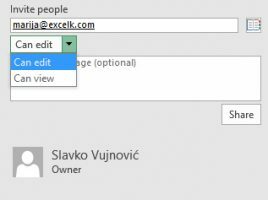 Newer versions of Excel no longer support the document sharing option I have written in one of the earlier texts. It can still be used after manually adding to the quick menu or toolbar, but collaborating on documents has evolved into co-authoring. This means that the documents are saved on the OneDrive repository, and that the right-hand users can change them at the same time. 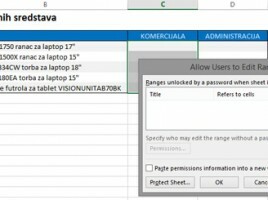 With Protect Sheet and Protect Workbook, a user can protect a worksheet or workbook so that only a person who knows the correct password can access them. However, what if we want to protect only part of the worksheet? Also, if more than one user is simultaneously working on the document, is it possible to grant them different access rights? Can the system administrator use domain rights for this purpose? Meet the Allow Users to Edit Ranges option. A digital signature is a way to check the authenticity of a digital message or document. A valid digital signature is a proof that a message or document has been created by a well-known author, and that she has reached the recipient in the unmodified form. 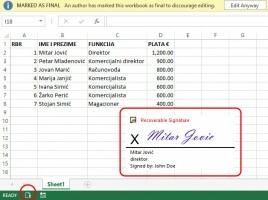 The text that follows will first be about the digital certificate, then how the user signature is inserted into the Excel, the digital certificate is appended and the digital signature of the document is generated. At every company there are certain data that should be kept secret. Also, sometimes we do not want everyone to be able to edit the document, especially when it comes to corporate reports that should have a unique form. 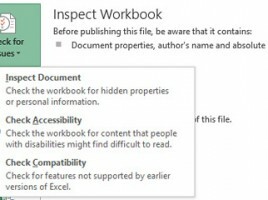 Since Excel is a tool frequently used for budgets or as a tool for interpreting business reports, it’s important to know how to protect individual worksheet elements, the structure of the workbook, and the workbook as a whole.